In an area that is already packed with first class entertainment options, Tompkins County community organizations, businesses, and residents now have the option to bring entertainment right to their door. 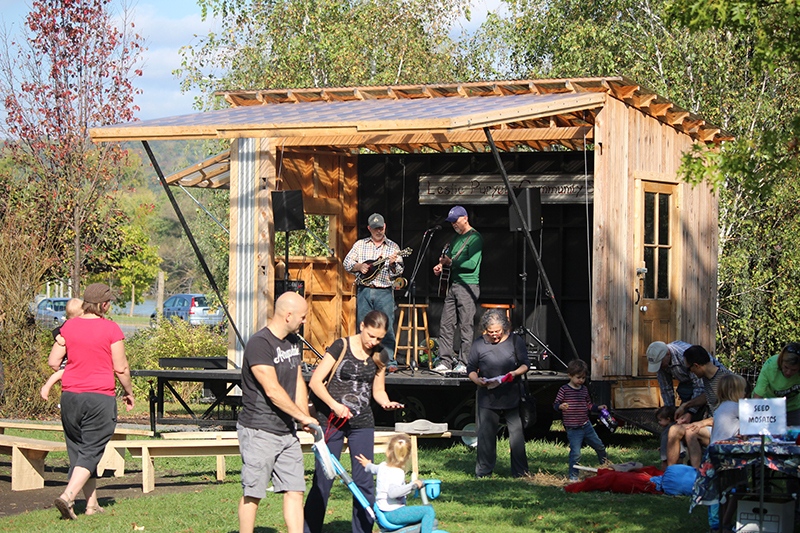 The Leslie Puryear Community Stage, named in honor of long time GrassRoots Festival organizer and community supporter Leslie Puryear, is available to rent for public community and private events throughout Tompkins County. The enclosed stage was initially created by the Cornell group, Building Community. Building Community held workshops and solicited tool donations for future community build projects, and gifted the trailer to Ithaca Generator (IG) in April of 2017. IG then collaborated with GrassRoots Festival organizers and volunteers, most notably Jordan Puryear and Alan Vogel, to modify the trailer and construct the stage. This included welding the stage to the trailer, constructing a fold-out canopy, and building benches that are housed in the trailer and brought out during events. So far the stage has been used for the Congo Square at the GrassRoots Festival, events at Ithaca Children’s Garden and in Press Bay Alley, and at Trumansburg WinterFest. Indeed, the stage can be used for more than building community through entertainment, workshops, and other hands-on-learning opportunities. Businesses who rent the stage provide an opportunity for entertainment or team building to their employees, while also supporting local community organizations, as part of the proceeds from the stage rentals will be donated to local non-profits. Renting the stage is an exciting way for individuals and families to celebrate special occasions such as weddings, birthdays, or family reunions. Fees are being established, but it will be accessible to all, as the ultimate goal for the stage is to have it used to bring joy and enrichment to all aspects of the community. If you are interested in learning more about the stage, have an idea for its use, or if you would like to rent the stage for an event, email Elaine Springer at elaine@grassrootsfest.org. You can also follow along on Facebook, @LesliePuryearCommunityStage.